Rabies is a serious infection that affects the brain and the nervous system and can even be fatal if left untreated. Therefore, the rabies vaccine is given to people who are at an increased risk of rabies to protect them if they are exposed to the virus. The vaccine can also prevent the disease if it is given to a person soon after they have been exposed to the infection. At Apollo Clinic, we understand the uncertainty of such a scenario and the role of vaccinations in such cases. Therefore, we are committed to supporting you in all your health concerns, ensuring that you are given the best medical treatment. Rabies is a severe viral infection that is caused by the Rhabdovirus family and is transmitted through the saliva of an infected animal after they bite or scratch another animal or human being. This disease affects the brain and the nervous system of the infected human and therefore, must be prevented in time. In the early stages, the symptoms of rabies are quite non-specific but gradually affects the respiratory system, gastrointestinal system, and the central nervous system. Death due to the failure of the respiratory system is quite typical in cases where the person is left untreated for a while. Therefore, the rabies vaccine for humans is the most effective way to prevent yourself from the disease. If left untreated for a longer period, the symptoms tend to turn grave. This mostly includes aggressive behaviour, agitation, hallucination and producing lots of salivae; and can even lead to death. What is a Rabies Vaccine and How Does It Help? The rabies vaccine is made from killed rabies virus and cannot cause the disease to occur. It is given to people who are at higher risks of transmitting the disease. The vaccination can also prevent the onset of the illness if given to a person after they have been exposed to the infection. Who Should Get the Rabies Vaccine and When? The rabies vaccine for humans is given to people in two scenarios. One is a preventive vaccine (no exposure), and the other is the vaccination after exposure. People such as animal handlers, veterinarians, rabies laboratory workers, rabies biologics production employees and spelunkers are often at a high risk of exposure to rabies. Therefore, it is essential for them to be vaccinated against the disease. The vaccination must also be considered for international travellers who are more likely to come in contact with animals from different parts of the world where rabies is common. For laboratory workers and others who are regularly exposed to the rabies virus, periodic testing for immunity is highly recommended, and booster doses must be given as needed. Any person who has been bitten by an animal, or who may have been exposed to the rabies virus, must clean the wound and visit a doctor immediately. The doctor will determine if you need to be vaccinated or not. A person who is exposed and has never been vaccinated against the disease must get four doses of the rabies vaccination. One immediately, and the additional three doses on the 3rd, 7th and 14th day respectively. Another shot known as the Rabies Immune Globulin is also recommended to be taken at the same time as the first dose. A person who has previously been vaccinated must get two doses of the rabies vaccine. One right away and the other, on the 3rd day respectively. Here, the Rabies Immune Globulin is not needed. Rabies vaccination prevents you from the disease. The vaccine may sometimes cause temporary soreness, swelling, and redness at the site of the injection. Some people may also experience a headache, mild fever, vomiting, muscle aches and a rash. 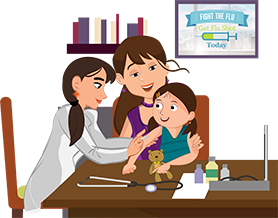 At Apollo Clinic, we understand the importance of your health and the role of vaccinations. Therefore, we provide services for immunisations, one of which includes the rabies vaccination for adults that will help protect you from the disease. Offering immunisations for adults, our aim is to assure that you are safe from diseases and live a healthy life.